Our Model 5935 Low-Pass Risetime Filters are designed for OEM use in high speed digital networks and telecom systems. Our risetime filter is designed to have the best possible transient response. Model 5935 uses a proprietary, absorptive filter design that has attenuation and group delay frequency responses similar to those of the 4th order Bessel-Thomson filter. Traditional Bessel-Thomson designs filter by reflecting stop-band frequency signals and thus can cause increased bit error rates and eye diagram closure due to multiple reflections. By contrast, the PSPL filters filter by absorption. They have excellent impedance matches and very good return losses, both within and above the filter pass band. 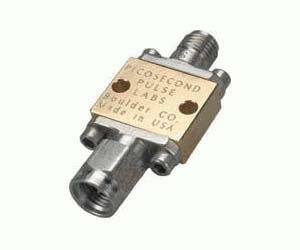 Model 5935 has a 28 GHz -3 dB frequency and is available with 2.92, 2,4 or 1.85 mm connectors.